The start of the new year marks the beginning of a whole host of flower festivals here on Okinawa. Traditionally, it begins with Cherry Blossoms. 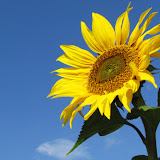 But in late January to early February starts another special flower occasion,...the Himawari Matsuri, or Sunflower Festival, in Kitanakagusuku Village (北中城村のひまわり祭り). This is relatively a recent installment of flower festivals here on the main island first starting in 2008. About 22,000 square meters of farmland are dedicated to these yellow beauties. Special events during the festival period will vary from year to year. You will also see booths selling arts and crafts, vegetables, and other gifts for your enjoyment. Amenities/Facilities. Normally, portable toilets are dispersed near the parking lot areas. Be prepared to improvise if need be. 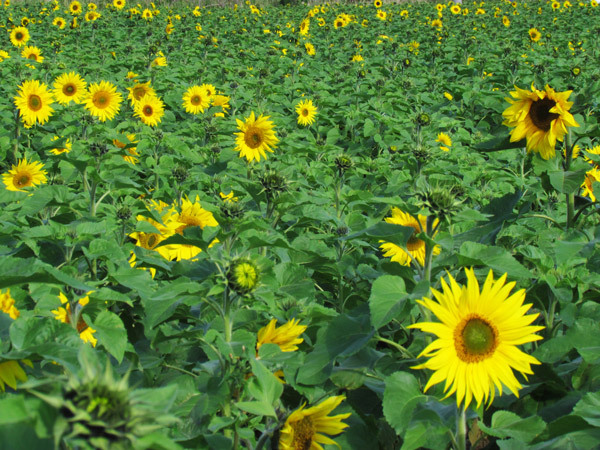 Baby Strollers/Wheel Chairs: Around the sunflower fields are paved roads for ease of movement. However, it may be difficult to go inside the flower field itself with any kind of transport. There are areas that are padded down for ease of movement. Expect occasions of rain and muddy areas. Directions/Parking. The field is in Waniya of Kitanakagusuku Village. Take Highway 329 south into Kitanakagusuku Village. The field is south of the Highway 81/Highway 227/Highway 329 intersection. 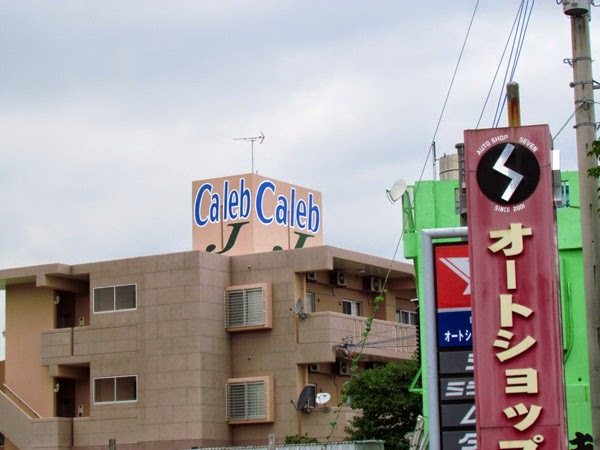 There will be three (3) landmarks to the west side of Highway 329 to guide you in: Building with "Caleb" written on it, Family Mart, the ESSO Gas Station. At the next traffic light signal south of the ESSO Gas Station turn east (towards the ocean). You will be guided by signs. 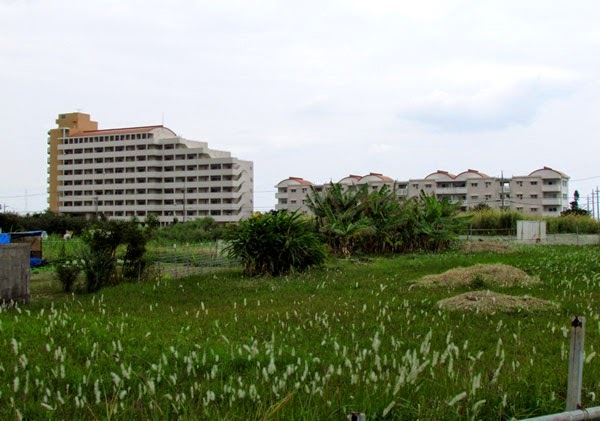 You will also see a large apartment complex. The sunflower field is walking distance to the west and across from this complex. Parking signs should be posted. 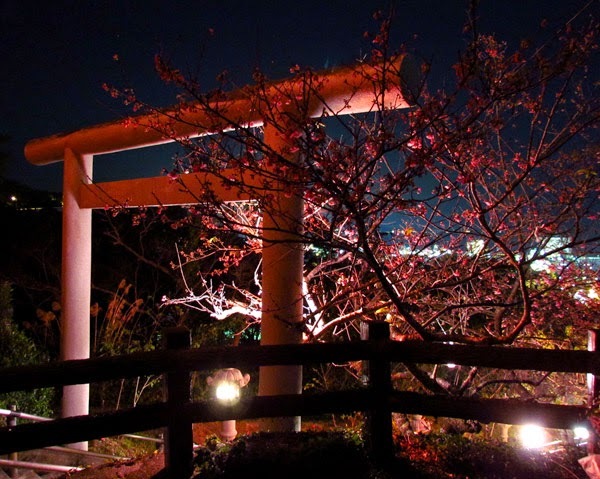 Late January to early February, Nago City hosts the Cherry Blossom Festival at the Nangusuku Castle Site Park across from the Orion Brewery. 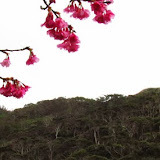 Thousands of visitors come and take delight in the cherry blossoms as they ascend up the hillside park; and up above you can gaze upon the vast surrounding landscape of Nago City with the East China Sea and the Motobu Peninsula in the backdrop. The festival is a two-day weekend event. See festival information below. 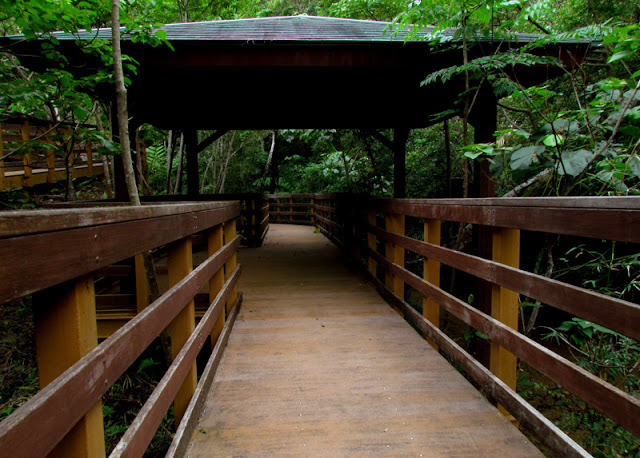 Baby Strollers/Wheelchairs: The park has a network of paved roads to help you navigate through the park. However, there will be areas with steps and makeshift stairs. Plan accordingly. 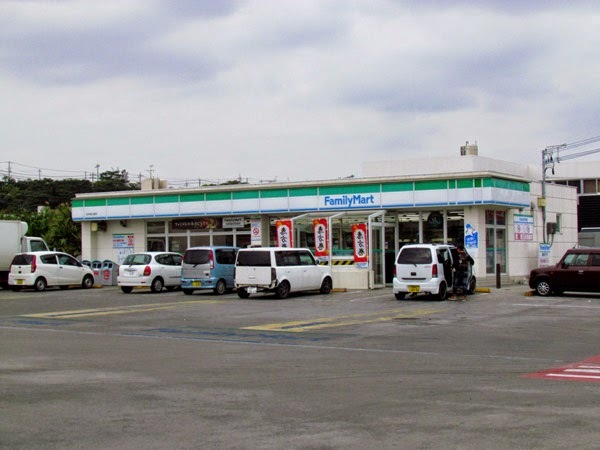 Parking: The main parking area will be at the Nago Fishing Port (near Highway 58). It is about a 10 minute walk to the main festival area. Scroll map to the west to see fishing port. Website: https://nagomun.or.jp/event/1606/ (Japanese only). Translation may be required. Note: If you have never been to the Nangusuku Castle Site Park, prepare for a lot of walking up the the hillside. Road networks (closed to vehicle traffic during the festival period) traverse up the mountain aiding you to view the entire park on foot; The long stairway to the hillside shrine is little over a 450 steps. 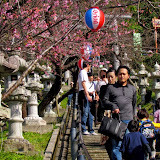 The stairway is optional; a road can also take you near the small shrine as well. Directions. (Recommendations) Because this event falls on the weekend, heavy traffic is expected at the merger of Exit 10 (Expressway) and Highway 58. Additionally, it will not be uncommon to see traffic backed up on the Expressway from Exit 10. Option 1. 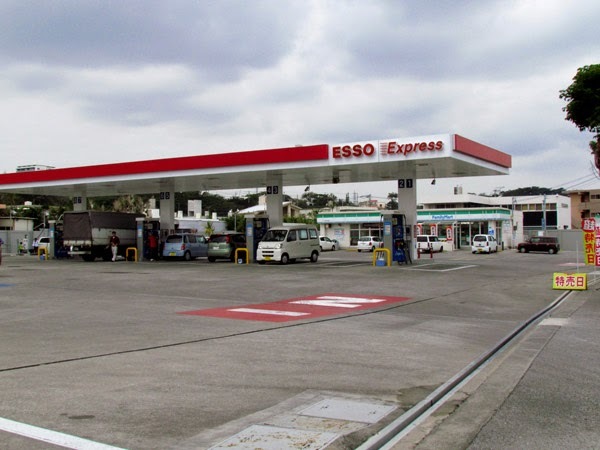 (If using the Expressway), Recommend departing off Exit 9 (Ginoza Village) and then take Highway 329 north into Nago City. Then proceed north on Highway 58. The Nago Fishing Port (event parking area) will be on your left side (west of Highway 58). Option 2. Take Highway 329 north into Nago City. Then proceed north on Highway 58. The Nago Fishing Port (event parking area) will be on your left side (west of Highway 58). Other Cherry Blossom Festivals on Okinawa. Mt. 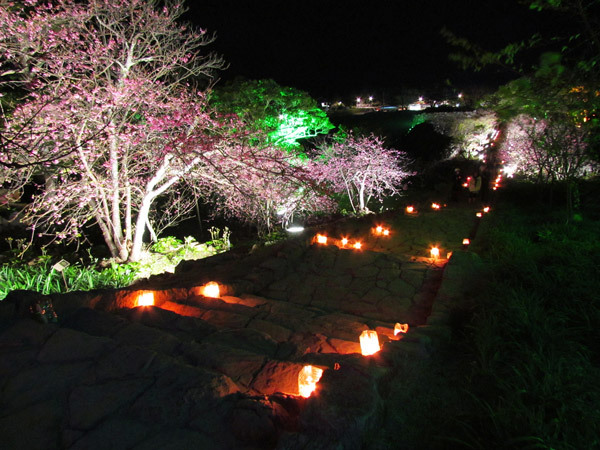 Yaedake Cherry Blossom Festival, Nakijin Castle Night Illumination (Cherry Blossoms). 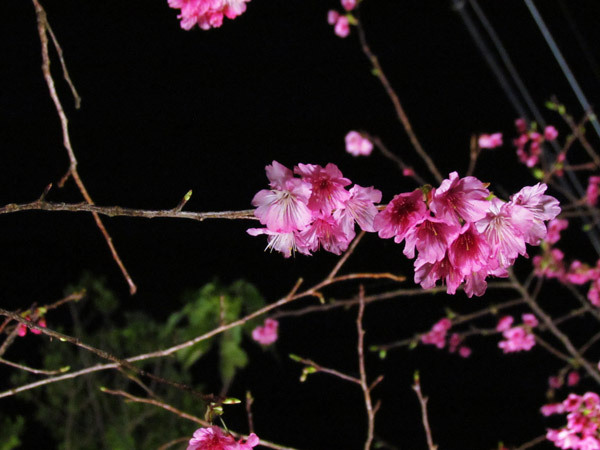 Cherry Trees in Okinawa Prefecture are said to bloom before anywhere else in Japan. Mid-January marks Cherry Blossom season and every year, thousands of visitors travel to Yaedake and Nakijin Castle, to see the first blooms. 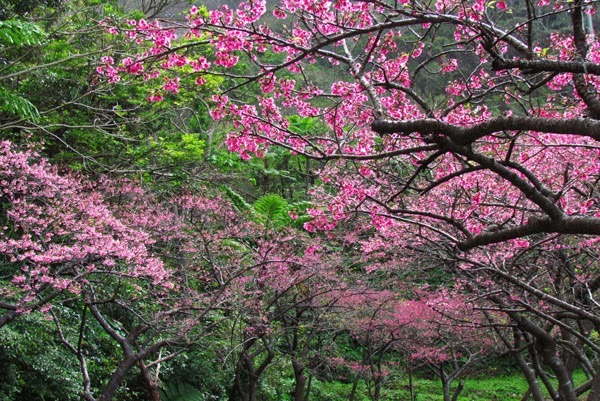 It is claimed that over 7000 Cherry Trees occupy the hillside of Mt. Yae. (1) The Cherry Trees found here (Prunus campanulata maxim)(1) are different than those found in Mainland Japan. They are said to come from Taiwan and southern regions of China. 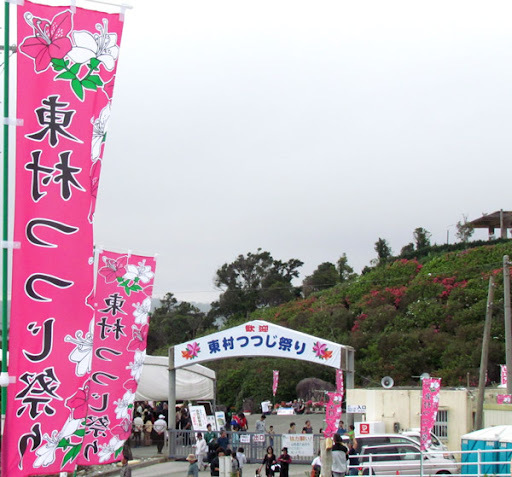 (1) Every year, the Motobu Town Office sets up a Cherry Blossom Festival or Sakura Matsuri (桜祭り) towards the latter part of January for about two weeks. Below is basic information for the Yaedake Cherry Blossom Festival. Time: There are no opening or closing hours to enter. However, the best time to view the flowers is during the day. Peak Viewing Time. Typically, last week of January. Parking: Available (various locations). Parking attendants should be available to direct traffic. 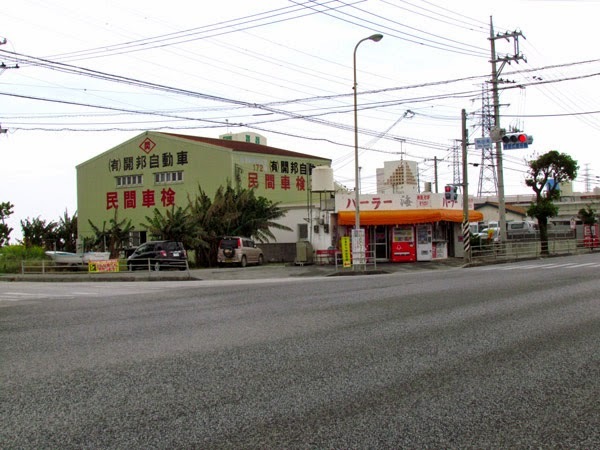 Websites: Motobu Town Website (Japanese only). To go directly to information site visit here. Translator may be required. Recommendation (Please Read). Expect heavy traffic up the hill on Mt. Yae during the festival period. If you wish to see Cherry Blossoms without the traffic, it is recommended that you see them the week prior (though they may not be in full bloom). There are different access routes to Mt. Yae as you can see on the map above. 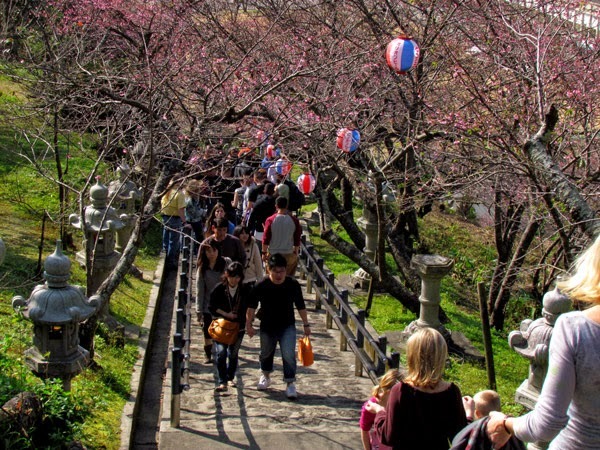 However, the blue route has Cherry Trees along both sides till you get close to the top (Note. You cannot reach all the way up Yaedake. There is a communications tower that is off limits to non-official personnel). 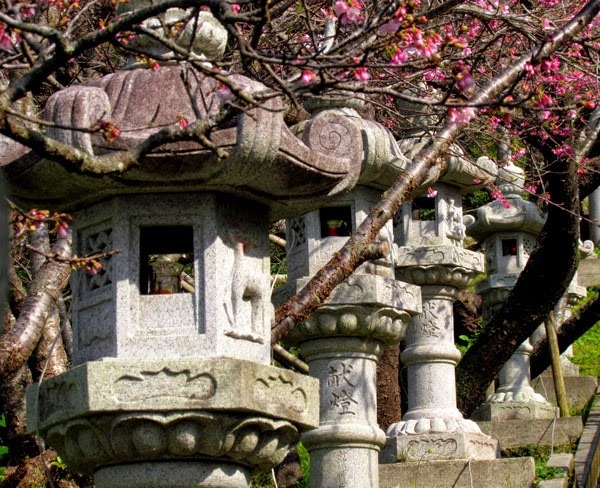 The Nakijin Castle Cherry Blossom Festival will be held January 26th to February 11th. Consider going to both during the overlapping dates. 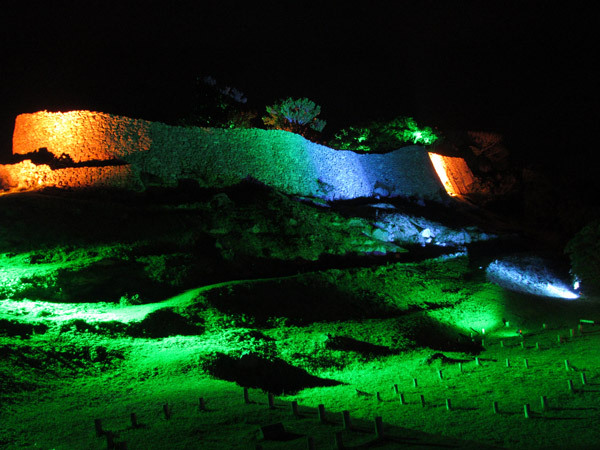 The Nakijin Castle Night Illumination during the festival period has the edge over any Cherry Blossom Festival after hours. 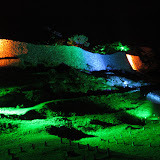 Please see article, Nakijin Castle Illumination (Cherry Blossom Festival). Directions. Take Highway 58 into Nago City, then Highway 449 to Motobu Town. You will then want to take Highway 84 heading east. 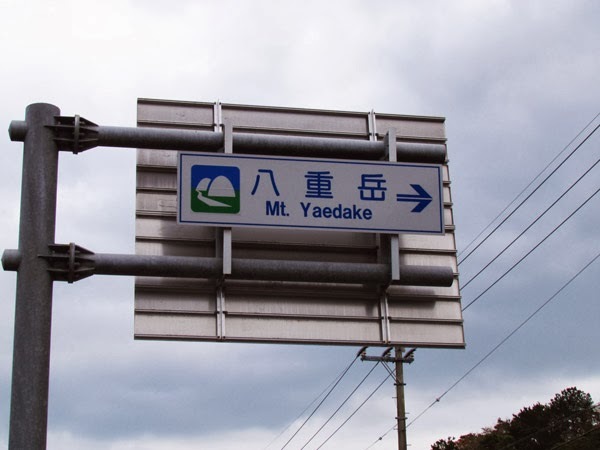 You will see a sign marking the Mt. Yae Entrance (Pink Thumbtack in the map above). 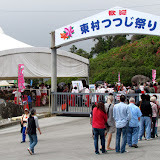 "Tsutsuji Matsuri - The Azalea Festival"
Every March, Higashi Village hosts the Azalea Festival, or better known to the Okinawans as 'Tsutsuji Matsuri'. The Azaleas are part of the genus Rhododendron, with these particular flowers being part of the subgenus 'Tsutsuji' (or 'Tsutsusi'), which are evergreen Azaleas versus their North American counterparts that are deciduous in nature (leaves fall off in the fall). The festival occurs at the Azalea park about 500 meters away from Highway 70. The festival itself last about 3 weeks long with various events and entertainment spread out during this period. 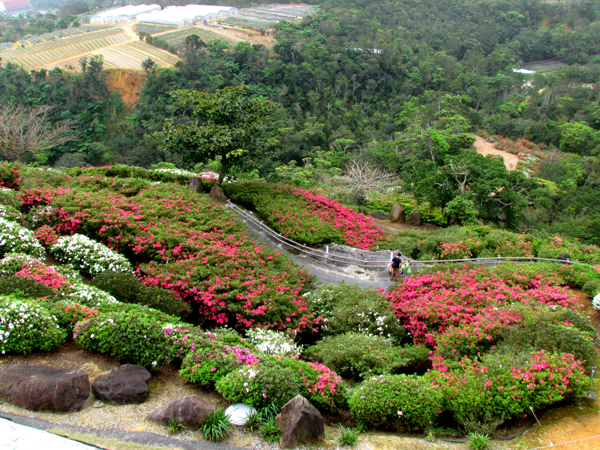 However, you can still view the Azaleas for the entire month of March. Please visit the Higashi Village website for more information (Japanese only). They will have a schedule of major events and entertainment during the festival period. The park itself is a nice walk on both high and low ground. Down below are small nature walk areas where you can see the Higashi greenery and some of the streams that flow between the hills. High up on the hills are several areas where you can view down and out toward the Higashi landscape. 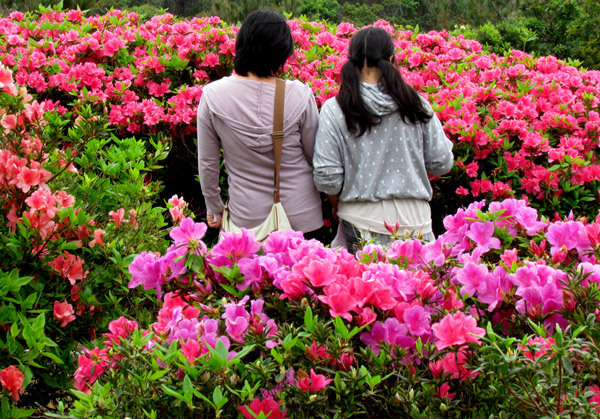 If you love nature and especially flowers, then this is great place to bring the family. Directions. Take Highway 329 into Nago City. Then take Highway 331 going north on the eastern side of Okinawa. From Highway 331 take Highway 70. Look for the road signs off of Highway 70 that point to the Azalea Park. During the festival period you may see numerous banner flags along the road side that lead you to the Park. See map for other landmarks of the area. 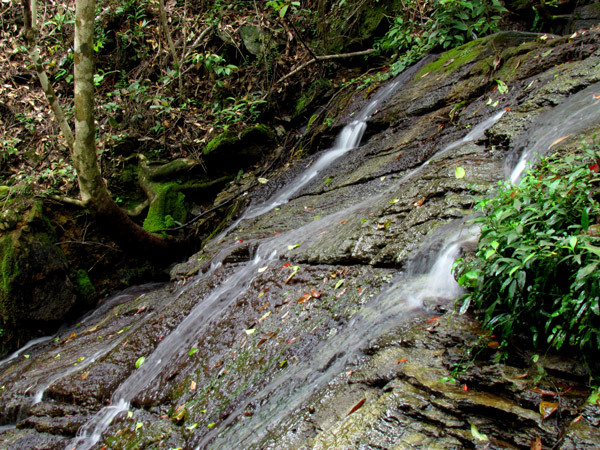 Other places of interest nearby: The Sakishima Sappanwood Tree (Higashi), The Higashi Museum, Meoto Waterfall.